These days it seems like everybody wants a tiny house. But what if your home isn’t adorably tiny? What if it’s just sadly small? Don’t worry—it’s not your square footage that matters most; it’s how you present it. Even if you’re tight on space, you can fool buyers into thinking things are bigger than they appear—you just have to have some smart tricks up your sleeve. Keep reading for our experts’ savviest and sneakiest tips for seeing big returns on the petite place you currently call home. 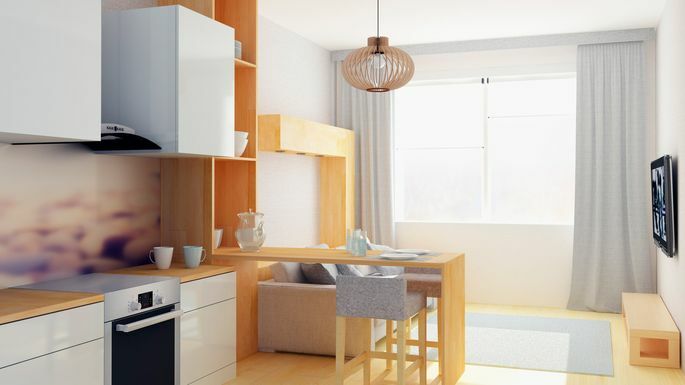 The less clutter, the bigger your home will look and feel to potential buyers. To get rid of your unwanted items, throw a party before your first open house, suggests Laura McHolm, co-founder of NorthStar Moving. Still feel like your home is full of stuff? “Box up everything you don’t need on a daily basis and anything that’s smaller than a football,” suggests home staging expert Lori Matzke. Sift through your glass cupboards and built-ins, and clean off your countertops. “Leaving just the bare minimum will create the feeling of more space,” she says. That goes for your beloved tchotchkes, too. “A smaller space tends to favor a more minimalist design, so having all of your collectible figurines on display on the shelves, side and console tables will bring the room in rather than opening it up,” says Bee Heinemann, marketing director and interior decorating expert at Vänt Wall Panels. If your windows are hiding behind cumbersome drapes and other coverings, now’s the time to take them down. Leave your windows bare, or hang sheer linen curtains. 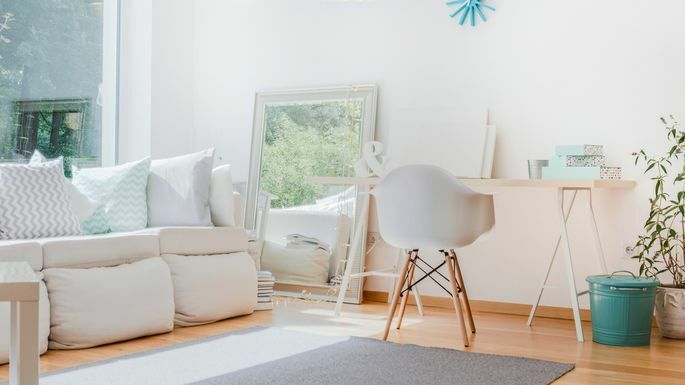 Painting every single room the same color isn’t an artistic cop-out—in a small home, it actually serves an important purpose. “It prevents your space from feeling choppy, and gives it more of a continuous feel,” Matzke explains. The same idea goes for your furniture and accessories. Try to reduce contrasting colors wherever possible, suggests Justin M. Riordan, founder of home staging company Spade and Archer Design Agency. 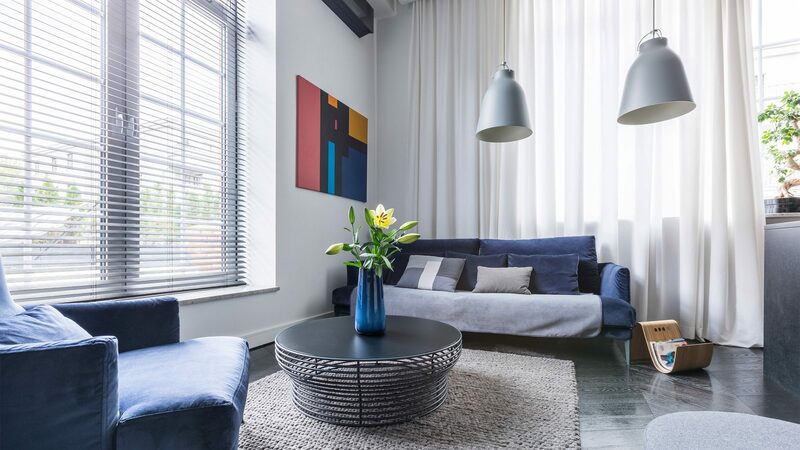 Contrasting hues create definition, and definition will make it that much more obvious that your space is small. Instead, opt for similar tones. “If you have a room with taupe walls, walnut floors, a brown sofa, and milk-chocolate pillows—all various names for medium brown—the edges of each item will be less defined and, in turn, be perceived as taking up less space,” Riordan explains. Similarly, if you’ve got an affinity for wild and colorful designs, it’s time to rein it in. To avoid making buyers feel claustrophobic, “keep prints to a minimum and offset them with solids drawn from the same palette,” Heinemann says. Don’t be afraid of blank space! Resist the temptation to cover your walls with artwork or other hangings. As in, lots of light. “Add the highest possible wattage bulbs to all the lights in your home,” suggests Nancy Haworth, a professional organizer in Raleigh, NC. Daylight-toned bulbs, in particular, “provide a natural-looking light that can help make a small space seem larger,” she adds. “The more you break up the flow of your flooring, the smaller your space will feel,” Matzke cautions. To prevent that from happening, limit rugs to only one or two main areas such as under your dining table. Just make sure the rugs aren’t too tiny—small rugs can actually dwarf a space. Mirrors can be a magical design tool. They can brighten a dark room and make a small space look much bigger by reflecting natural light, Heinemann explains. Before you go wild with mirrors, make sure you know where and how to hang them (there are some things you shouldn’t do.) But generally, if you place a mirror next to—or directly across from—a window, it’ll trick visitors into thinking there’s more depth to your house than there actually is. Baby didn’t like them, so don’t put your couch, bookshelf, or nightstand in the corner, either. This means you might have to send Aunt Esther’s dark walnut hutch to storage. Not forever, mind you, but until your home sells. “When it comes to furnishings, materials like glass and metal—which reflect light and feel more airy—give more sense of space than dark, heavy wood pieces,” Heinemann explains. 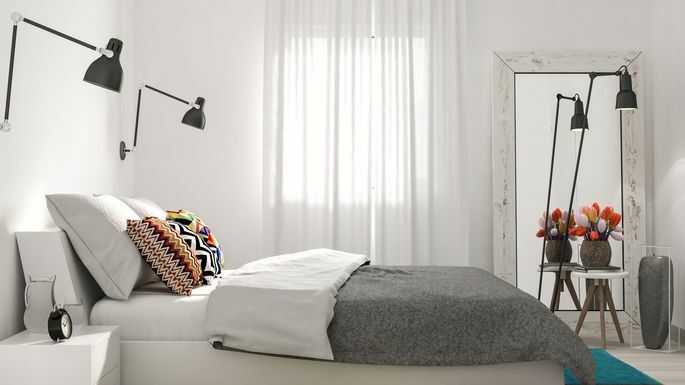 Keep colors and textures on your bed uniform—and lighter weight is better. Wherever you can, you want to raise the bar—of your shower curtains and window treatments, that is.